There are days when we feel extremely downcast and so lonely(run the Akon song here for effects!) that the whole world seems to pass us by. There is no hope in sight and days are dark and nights even darker. Anxiety and depression sets in and we keep wandering from one disaster to another. There almost seems to be no end for the depression. But, whenever there is a trough; there is always a peak near by. 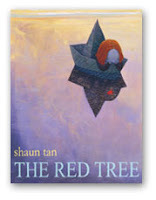 This is the idea that is portrayed in this rather dark picture book by Shaun Tan called The Red Tree. A name less girl wakes up to find her room filled up with dry leaves which slowly envelope the whole room. 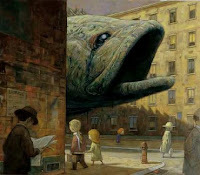 She gets out and as she walks through the streets, there is a big crying fish that throws a dark shadow all over her. Every imagery that accompanies her through her journey is dark and poignant. We have no clue why there is always a great depressive mood hanging over her. But, it does not matter. Sometimes we get into depression for a rather small reason and sometimes the reasons are rather big. All we know in the illustrations is that the nameless girl is struck by a nameless / reasonless depression from which she is trying hard to get out. After a long wait, she returns back to her room to see a beautiful red tree blossoming right in front of her bed. If you ever had a doubt that images can speak a thousand words; please stop by and pick up this book. One will be amazed by the brilliance of this young illustrator. Although this is a picture book, it is definitely not for our 5 year olds. It is more for young adults and people like us. It is the book that you may gift to a friend who is going through a rather tough time. Young children might not get it at all(or atleast that is what I think!). "I'd also been increasingly aware that illustration is a powerful way of expressing of feeling as well as ideas, partly because it is outside of verbal language, as many emotions can be hard to articulate in words. I thought it would therefore be interesting to produce an illustrated book that is all about feelings, unframed any storyline context, in some sense going ‘directly to the source’". Aptly summarises this picture book. ps: For more pictures/illustrations by Shaun Tan, check out the French site LaBoite Images , Lines and Colors and his own site. Thanks for introducing our readers to such great works by some amazing authors! 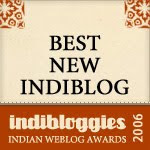 I briefly looked at the websites you've provided links to - the lines and colors one was in particular very interesting. praba, lines and colors is a very good site on illustrations.. Both these are akin to boing boing of illustrations..
you guys are on my blog roll!